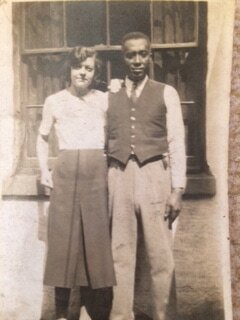 Aubrey George Bowers was a Jamaican sailor who settled in the port of Hull during the early twentieth century. He married a local women, Maria Haynes, and they had two children Aubrey (Jnr) and Jennifer. With thanks to the Bowers family, we present Aubrey Snr and Aubrey Jnr's stories together with oral history contributions from son and grandson Jason with his memories about them (which can be listened to HERE and at the bottom of this page). Jason's own oral history can also be heard HERE. 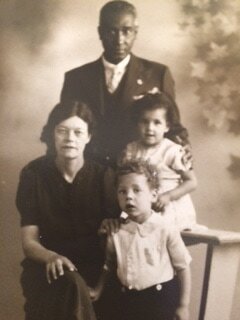 These stories demonstrate that Bowers legacy is far reaching and fully anchored to Hull and offer a fascinating example of the many multigenerational stories of people of African heritage in this region. 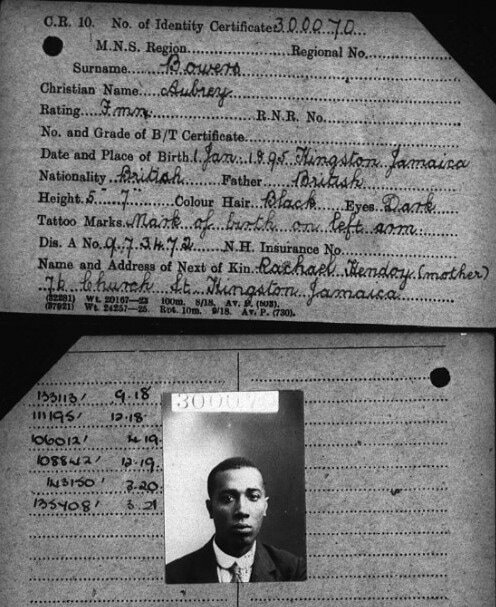 Aubrey George Bowers was born on 30 December 1892 in Beckford Crawl (Kraal), Clarendon, Jamaica. His mother was Rachel Henry and his father was chemist James Bowers. Unfortunately, Aubrey’s early life remains a mystery. However, it is believed that he was the oldest of Rachel’s children. It is possible that his father died when Aubrey was a small child as Rachel went on to have two children with James Sutherland. Although the pair did not marry until 11 May 1924, they had a son, Vincent on 5 March 1896 who also travelled to Britain and worked as part of the Merchant Marine in World War One and a daughter Ambrozine who was born in 1904. When Aubrey left the Caribbean around 1915, his family were residing at 76 Church Street, Kingston, Jamaica. This address was only a short walk away from the hustle and bustle of Kingston harbour where it was likely that Aubrey and his brother were introduced to the maritime world of short and long distance shipping. When Aubrey arrived in Britain during the First World War, he pursued his career at sea while helping the war effort as part of the Merchant Marine. Interestingly, in August 1917 Aubrey was employed in the engine room of the Polladern steamship which was listed as ‘On His Majesty’s Service’ (O.H.M.S). It is probable that this vessel was carrying troops across the sea which explains why it has proven to be untraceable. Life at sea during this time was exceptionally dangerous and being in government employ only increased the chance of attack by an enemy vessel. In 1917 alone approximately 1,000 British sailors died as a result of the global conflict which transcended the boarders of Europe into open warfare at sea. Thankfully, Aubrey survived the voyage and was discharged from the Polladern in London on 3 August 1918. His next voyage took him back across the Atlantic, this time to Montreal on board the Mongolian Prince. It is probable that he was on his way back to Britain aboard this ship when he received the news that the war was over. He arrived in Hull possibly for the first time on 24 November 1918 and it is clear the port made an impression on the Jamaican sailor. On this occasion he was only in Hull for a month before he set off on another voyage to the USA as a fireman and trimmer on board the Elakonia. By the time Aubrey returned from this voyage it was probably becoming increasingly apparent that race relations in Britain were gradually getting worse as tensions over unemployment started to boil over into racial prejudice against Black seafarers. Aubrey was not employed on board another steamship until 27 May 1919 when he worked as a Fireman in the engine room of the Porthia which travelled across the Atlantic from Liverpool to Virginia. He returned to the Port of Glasgow but eventually made his way back to Hull. On 18 August 1919 Aubrey applied for his First World War medals which were sent to the Merchant Marine Office in Hull located at Posterngate. He received two ribbons, one for his service in the war and another for the role he played in the Merchant Marine. Unfortunately, his medal card does not confirm whether he received the minted coins which accompanied each ribbon. Throughout 1919 race relations in Britain continued to get worse and by the summer what has been termed as a ‘colour bar’ became prevalent in port cities. This meant that colonial seamen found it particularly difficult to find work because of exclusionary practices. They were also refused lodgings and entry in to a number of social clubs. Although, Aubrey was a well-respected fireman and trimmer who received a rating of very good after each voyage, he was affected by the ‘colour bar’ highlighting that even the best colonial seaman could not avoid unemployment. 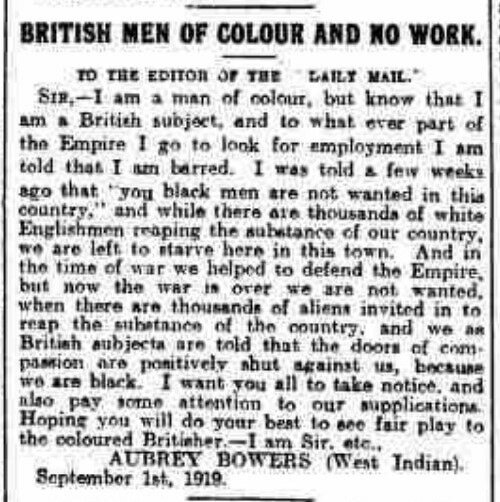 On 1 September 1919, Aubrey wrote a moving letter to the editor of the Hull Daily Mail entitled BRITISH MEN OF COLOUR AND NO WORK (right) in which he described the racist attitudes which permeated the public sphere. He very eloquently detailed that he had been advised “you black men are not wanted in this country.” However, as Aubrey pointed out during the war he had been accepted as a British citizen and had played a vital role in defending the nation and Empire. Like many other merchant seamen, Aubrey felt that Britain had turned her back on them because they were Black, at a time when they needed her most. Aubrey was unemployed between May and December 1919. This was a long period for sailors who were used to travelling across the seas sometimes as often as once a month. Aubrey was most likely one of the men who visited the docks daily looking for work. In early December he travelled to Manchester and gained employment on board the Manchester Importer. While Aubrey had ventured across the Atlantic on several occasions, it was during this voyage that he first visited Canada. After this venture he was out of work again for two months before returning to sea as a Fireman and Trimmer in March 1920. The re-employment of Black seamen on board British ships did not mean that racial tensions had abated in the city. In June 1920, race riots broke out in Hull. However, thankfully Aubrey was somewhere in the Atlantic when chaos engulfed the city. Between September 1920 and June 1921 Aubrey was employed as a fireman and trimmer on board two steamships which travelled to North and South America respectively. However, in July 1922 Aubrey decided he wanted to change his career. He exchanged the engine room of steamships for the kitchen becoming a Galley Boy on board the Peterton for two successive ventures. While he was at sea his brother Vincent died in San Francisco. However, it was probable that Aubrey never found out this information as the pair had not seen each other for years. Once his voyages on board the Peterton were over Aubrey attended the ‘The Shipping Federation School of Nautical Cookery,’ in Hull and was awarded a certificate to demonstrate that he had passed the training to become a cook. However, the maritime shipping industry depended on experience so when he was employed on board the Egwanga which travelled from London, to the West Coast of Africa and then back to Hull in 1923, he was still listed as a 'Galley Boy'. It was not long before he progressed to assistant cook on board the Southern Isles which sailed to North America in 1924. The vessel left and arrived back in Hull after 5 months at sea. He remained an assistant on his two subsequent ventures, on board the La Paz but with the added responsibility of also being the ship’s baker. Aubrey must have performed very well as once again he obtained the rating of ‘very good’ for ability and conduct. While Black men may have experienced racial prejudice after the First World War by the mid- 1920s this had largely abated and Hull had returned to a bustling multicultural port city. On 9 August 1925, a mere seven days after he had stepped off the La Paz, Aubrey was accepted into the Royal Antediluvian Order of Buffaloes or ‘The Buffs’ at it was more commonly referred to by its members. This organisation was one of the largest fraternal groups in Britain. He took a break from the sea for four months before he returned as a ship’s cook on board the steamer Trevanion. This must have been a very proud voyage for Aubrey running his own kitchen and rising to such as prominent position on board a steam ship. Despite his accomplishment of yet another ‘very good’ rating for this voyage, when he returned home in December 1926 he did not go back to sea for a year. This was not because he could not gain employment or that he no longer wanted to pursue his career, it was because he had fallen in love with Maria (Ria) Haynes. During this time Aubrey settled at 5 Georges Place, Mytongate and married Maria on 10 July 1927 at St James’ Church. Aubrey tried to be at home with his new wife as often as possible and together they moved to Bewholme Grove. Over the subsequent decade he took employment as a ships cook on board only fourteen vessels and ensured he had long periods at home in Hull with Ria. By comparison, between January 1937 and November 1938 Aubrey took employment on board five vessels. It is probable that he worked so much during this year so he could take another period of leave from his career at sea. However, in September 1939 within two weeks of Britain’s entry into the Second World War Aubrey was employed on board the Penolver. It is probable that the demand on shipping during the early months of the war was exceptionally high as Aubrey returned to sea on board the same vessel within a month of his return in December 1939 when Maria was heavily pregnant. 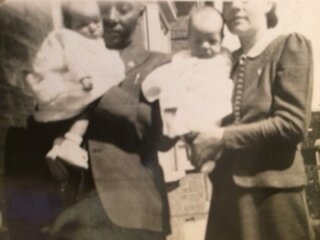 Unfortunately, Aubrey missed the birth of his twins, Aubrey George (jnr) and Jennifer Anne (above and below) on 23 February 1940 as he was at sea. He did not meet his children until mid- August when the twins were six months old. Aubrey remained at home for the following nine months to help Ria with their children. He went to sea twice more between 1941 and 1943 before being discharged from the Merchant Navy because he was deemed physically unfit at the age of 51. Aubrey occupies a relatively unique place in history as he worked during and survived both World Wars. After his discharge, his love for cooking propelled him to follow this career for several years as a cook on shore. Sadly, Aubrey died on 16 March 1954, at the age of 61. Ria and the twins who were only 14 were naturally devastated. After Aubrey died Ria had to go to work to provide for her family and the twins had to leave school at the age of fifteen. 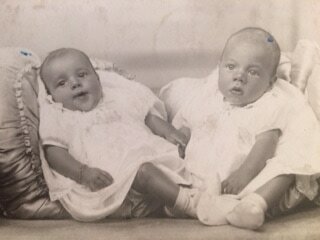 Aubrey George Bowers (Jnr) and twin sister Jennifer Anne (right) were born on 23 February 1940 in Bewholme Grove east Hull. Unfortunately Jennifer Anne sadly died in 1975 aged 35. The family lived in the same house in Bewholme Grove next door to Granny Booth and Nana Haynes for many years. After their father died, life was often a struggle for the twins in their early years during World War Two but their mother Ria wanted the best for them and they had dance lessons and music lessons though Aubrey Jnr just wanted to play outside. Aubrey and Jennifer attended Flinton Grove Primary school and then Aubrey went to Maybury High until he left school in 1955. He enjoyed school and did well academically. Aubrey loved music and played in the school orchestra as well as participating in the cricket and football teams and boxing club. Encouraged by his mother he had music lessons and learnt to play the banjo, piano and piano accordion at a young age. During the school holidays Aubrey would spend time in Scarborough at a boarding house in Aberdeen Terrace where Aubrey’s dad’s friend George ‘Doc’ Julius worked and lived. Apparently people came from miles around to enjoy his famous curries and Aubrey would lend a hand. Sadly as a child, Aubrey’s dad did meet with some racial abuse; he remembers witnessing this in the street when he walked to the seaman’s office in Posterngate. He faced this with courage and dignity. Aubrey’s skin was light and he had blue eyes so apart from the dark curly hair many people would be unaware of his mixed heritage. Jennifer had darker skin with straight black hair and dark eyes; she was always aware that she was different. Aubrey described his dad as a gentle, quietly spoken man who was a wonderful cook, had an infectious giggle and made Jamaican Jonny cakes. He always promised to take Ria to Jamaica at Christmas time but sadly that never came to fruition as he died on 16 March 1954 at the age of 61. Aubrey and Jennifer were only 14 years old. Aubrey left school at the age of fifteen and was successful in securing a job at the Royal Station Hotel as a commis waiter, he progressed through the ranks, met some famous people such as the Harlem Globe Trotters and the Beverley Sisters and finished his time there as a wine waiter. The job was always temporary and at the age of sixteen he was accepted in to the Merchant Navy. He began his training in Sharpness at the Vindicatrix training camp for twelve weeks. The young Aubrey set sail on one occasion from Victoria Dock, which he almost never made because he had left his accordion at home and went back for it, he then had to jump on deck as the ship was about to sail! He had a ‘baptism of life’ when the ship was berthed in London for some time. The ‘London Scene’ was a whole new world to a naïve 16 year old. Starting as a Galley Boy on the Sylvio and Southern Prince, he progressed to second steward. Aubrey sailed all over the world and saw many beautiful places, he loved New Zealand and one of his most precious memories was being greeted by the locals in Tahiti, who sailed out to the ship. When he returned in 1958 his mum was not well and struggling to cope with life so Aubrey made the decision to leave the Merchant Navy and support her. He then worked at the Pawn Brokers, Owen & Robinsons. Following the short spell there, Aubrey got a job at the ‘Hessle Road Institution’ Rosen’s Shoe Factory as a shoe operative (below). He worked there from 1958 to 1989 and each week for 30 years he professed to be leaving! He operated the four part lasting machine which was a complicated process, molding the shoe material on to the last. In the early days Aubrey’s mode of transport was a bicycle, not only did he have a long commute from east to west Hull each day, he would often ride out to Scarborough and Whitby after a full day’s work. He was a member of a ten pin bowling team as well as playing his guitar or piano in local social clubs. He also had to suffer the abuse if Hull KR beat Hull FC as most of his colleagues were from the west of Hull and FC supporters! Aubrey was an avid Hull City Supporter too and travelled the length and breadth of the country to away games when Hull City was in the lower leagues being a season pass holder up to his death. During his time at Rosen’s he met and married Pat and they had two children, Jason in 1971 and Phillippa in 1974 (above). 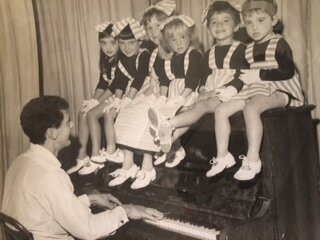 Pat was the principal of the Newbridge School of Dancing and Aubrey played the piano. He spent many hours writing and composing music at home and play at the classes most evenings. They ran a very successful dance school for many years. Following the sale of Rosen’s Shoe factory in 1989, Aubrey set up Hull Shoe Company in Londesborough Street with other colleagues. Although everyone worked extremely hard to make it work, 4 years later the company folded. Luckily Aubrey secured a job as the Maintenance Manager at a new home for young disabled people on Victoria Dock. He loved his work and the residence and was sad to leave when he could no longer continue due to his cancer treatment in 2001. Aubrey also wanted to try and trace some roots so in 1990 we travelled to Jamaica; we stayed in Negril and toured the Island, visiting Kingston to try and find out more but to no avail. Aubrey particularly loved cricket and in the late 1980s he and Jason went to Scarborough to watch the young West Indies team play England U20’s. He had seen in the newspaper that a Mark Bowers was playing so he asked the manager if he could speak to him. Mark told him that he was from Antigua and didn’t know of any connection to Jamaica so Aubrey asked if he would pass his details on to his parents when he returned. In 1992 we planned a holiday to Antigua with no remembrance of the conversation which had taken place twelve years earlier. Whilst there, we decided to get married. Amazingly it turned out that the tour rep at the hotel was the sister of the young cricketer Mark. The family came to the wedding ceremony and we have been accepted as family ever since. We have never managed to establish any lineage but the boys in the Antiguan Bowers family all have George as middle names and the girls have Anne. We have visited Antigua on many occasions over the years. Aubrey always felt that he had finally found a family connection. Ria was also delighted with the news. On returning from our wedding we moved out of our flat in Merchants Warehouse and moved into a new house on Victoria Dock. Aubrey was a skilled DIY enthusiast and gardener and worked tirelessly to create a garden and a lovely family home. Aubrey started to be poorly and we were shocked by the diagnosis of non-hodgkins lymphoma in the summer of 1998. Weeks later his mum died and it was the start of a 3 year battle with cancer. We had just embarked on becoming foster carers and continued to offer respite care for a while. Aubrey had two lots of surgery to remove his spleen, some set-backs, and 8 sessions of chemotherapy but seemed to be on the mend when it returned a year later. In September 1999 he had more surgery to remove part of his sternum and a couple of ribs and more treatment. Finally in 2001, he had a stem cell transplant in St James, Leeds. Remarkably, this treatment worked and Aubrey was looking forward to life again when in March 2001 he suffered a brain hemorrhage. He had surgery and eventually made a full recovery. He become everyone’s handy man, went to the gym and resumed his passion for fishing and Hull City. We had many wonderful holidays around the world and shared our lives with amazing family, friends and work colleagues. Christmas and New Year 2008 was meant to be spent in the Florida Keys, sadly we didn’t make it. Aubrey was admitted into hospital on 16 December and although he was home for Christmas he was diagnosed with lung cancer on 9 January 2009. Just 3 weeks later he was unexpectedly rushed back in to hospital and died on 29 January at 3.55pm. My life-long dearest wish would be that we had longer together; my profound loss and sadness is only eased by the countless things and love he brought to so many lives. I am so proud and truly blessed to have been his wife and share this story. Listen below to Jason Bowers' recollections about his father and grandfather and read the transcription. In addition, click HERE to hear Jason's own oral history interview. JW: Tell me something about Aubrey and its significance to your family. JB: Aubrey was my great grandfather, no my grandfather’s name so that’s Aubrey George Bowers who is known as senior now or for the purpose of this interview. So then we’ve got Aubrey George Bowers which was my dad or known as junior. And then there is a story of when I was born my grandma wanted me to called Aubrey as well but there was no way no way my mum was going to let that happen and me called, be called Aubrey Junior Junior. But - so it’s come, there’s, there’s Aubrey George in – the names but here’s also George that goes way back as a middle name as well – I’ve no middle name at all. JW: So tell me a little bit more detail. A potted sort of biography, history of each of these Aubreys. JB: The story with, - that I’ve been told from my father was that granddad was – very calm – collected and very polite – use to like cooking and use to tell my dad stories of about Jamaica and his upbringing. But I never, I never met granddad so all of these are just stories that I had heard. He had – a friend called Doc, who used to work in Scarborough and then there was also Mr Daley who would come to England with his wife and his daughter. JW: Your dad – quite Caucasian in the way he looked were there any incidents of racism when people realised something of the heritage of your dad? JB: Well, what we need to remember is the fact that my dad, was only 13 when his father died and there is one story that my dad did tell me whereby they were walking in the streets when my dad was young so he must have been 8, 9, 10? – and someone had spit at my granddad – and this is in the street. So that is the only occasion that he did mention to me. But that has got to affect any child at that sort of age because it’s your parent. Everybody looks up to their parent. For that sort of thing to happen in the street must, must really affect – your outlook or understanding of how people treat other people or have done in the past and again these are just stories that I know but having, looking at it now and, and looking back to that sort of time gives you totally different impression of, of what you imagine actually happened. JW: so did your dad experience any - ill feeling from other people? JB: Well other than his curly hair, he - didn’t, to be quite honest, look as though he had any sort of connection to Jamaica, the same way as people are surprised when I have. But it did, he did in respect of Jennifer who was a lot darker in skin tone to my father but again we’re coming back to the fact that you’ve got a white person that had married a Black person then had twins and one twin is darker than the other twin and we’re looking at the 1940’s so that in itself I, looking back now I can imagine caused all sorts of problems. And again living, living in a part of Hull that was not in the town centre just going to a normal school. Looking back I can imagine it caused all sorts of problems. But I should imagine again there’s a lot of stories that you don’t tell your children – with relation t o so my dad Aubrey Jnr – I just remember the creative side to his nature whether that would be playing the piano whether it was the physical creative, building things which I think is where I get a lot of my design side from whether that was fitted furniture that you couldn’t have in the 1970s that he would build, whether it was going out on a Sunday morning to Bridlington and fishing in a boat whether it was getting up on a Sunday morning and going to find mushroom in a farmer’s field and going to find mushrooms in a farmer’s field and getting chased out of the field – I just remember times of fun and excitement and again the most of opportunities – when we didn’t have a lot of money as a, as a family in the early 70’s but that didn’t stop us going out and exploring, travel or theatres or music events. That is one side and then I’ve also get the side where we use to be fishing – because I was a professional swimmer when I was younger which meant that more or less every spare moment – I was either took to swimming in the morning, swimming on a night, running around pitches, lifting weights, going to swimming galas on a weekend, we were always doing something as a family whether that was my sister in the dance class with my mum or me swimming on a weekend. So there was a lot of fun times there and we – just use to like to have adventures. JW: Give me something of – of how he looked. Describe him visually. JB: - my father was a little bit taller than me so he was about 6ft 1 / 6ft 2. Broad built and had curly hair which I think he made the most of in the 70’s late 70’s when disco was around. Let’s say it fit the bill then. JW: What about outfits, fashion? JB: Swing, jazz, piano. I can remember many a party on Grapefield that went on into the early hours - when I was a child especially New Year and we must have just had very understanding neighbours because it was either the piano or singing or dancing or rehearsals or so it was a very musical and creative household. Andrew Thompson and Megan Kowalsky, ‘Social Life and Cultural Representation: Empire in Public Imagination,’ in Andrew Thompson (eds) Britain’s Experience of Empire in the Twentieth Century (Oxford: Oxford University Press, 2012), pp. 251-297, p. 280. Hull Daily Mail, 2 September 1919, p. 2.